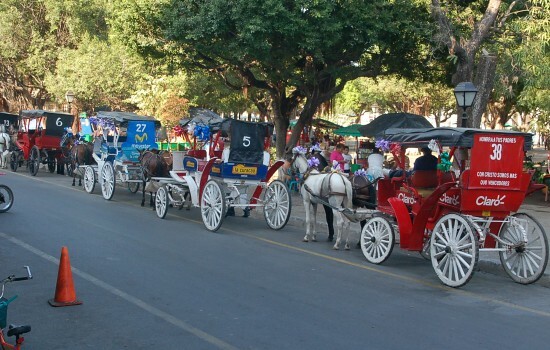 Carriages & Cathedrals down old Granada way – Not Just a Long Holiday – Back in New York! Granada bound, and as Neem mentioned at the end of the previous post, we had to get a few different modes of transport to get there from Las Penitas beach on the west coast. Getting a bus is pretty easy, once you don’t have much problems with your personal space. 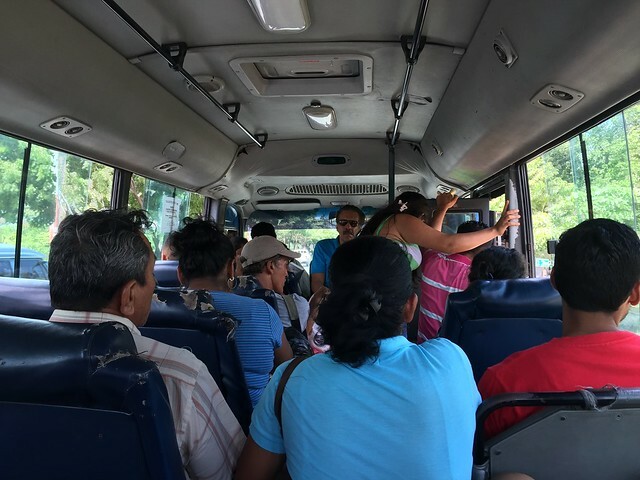 We mentioned the big chicken buses earlier and while these are the majority of buses in Guatemala, Nicaragua mixes it up a little with some smaller commuter buses. You still need to be prepared to get on while it’s moving to save precious time, and then navigate your way down the bus. What’s also great about travelling in Nica, it’s the roadside stalls at every bus stop and red light. Just open your window and very quickly order before the driver takes off again! 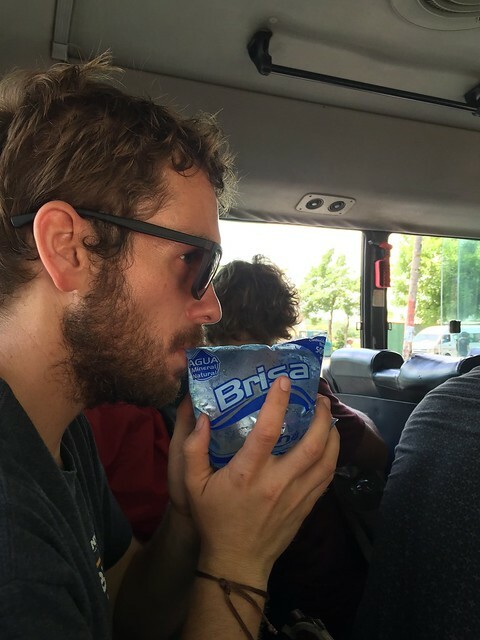 I got a bag of drinking water.. A bag! Check it out. 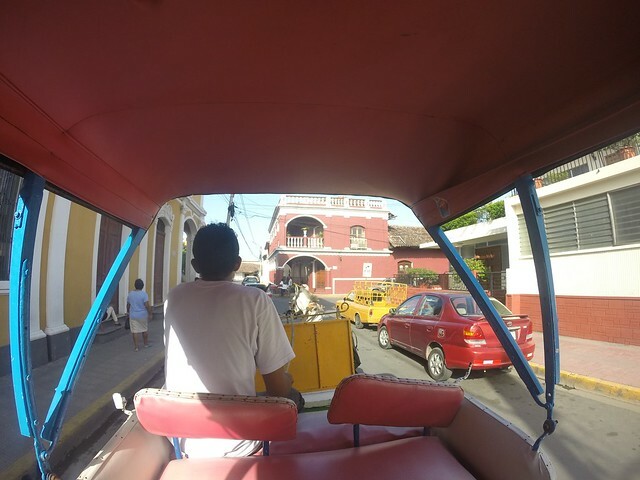 Granda is another spanish colonial town with UNESCO status to add to our list. 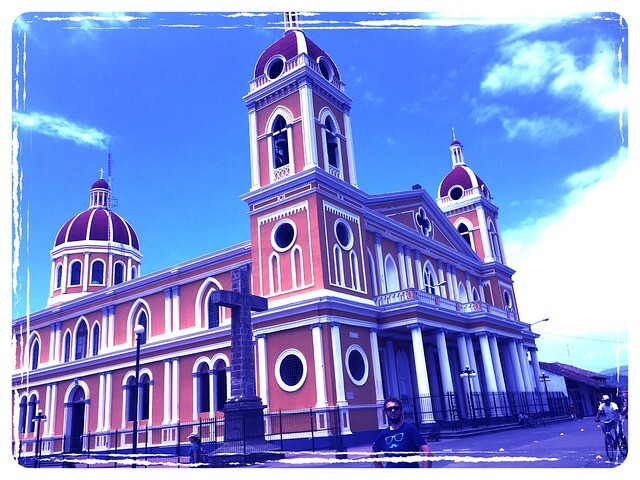 It rests on the shores of Lake Nicaragua, with a host of cathedrals to view, the main Cathedral of Granada below with a couple of others throughout the blog. 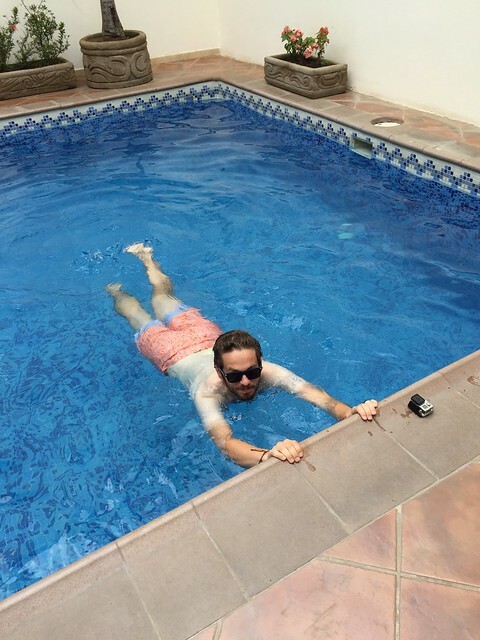 After suffering from dehydration quite a lot in Leon, we decided it was time to treat ourselves to a pool and AC. 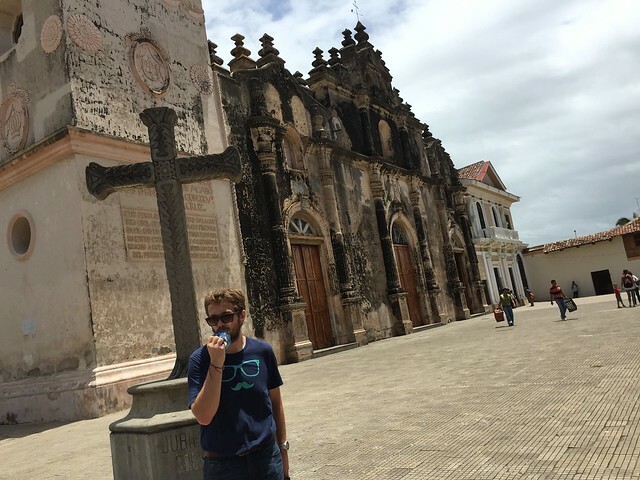 AC was a little bit of a luxury in Central America. I’m not too sure why because the temperature can really soar there. I had found a decent deal on hotels.com and jumped on it. It was badly needed as we had been somewhat “roughing” it for a few weeks now. Check out my farmers tan in the pool. A bit of lunch in an Irish pub (no Guinness on tap, much to my disappointment), local coffee and Neems much searched for Tres Leche cake before we headed back to our pool. 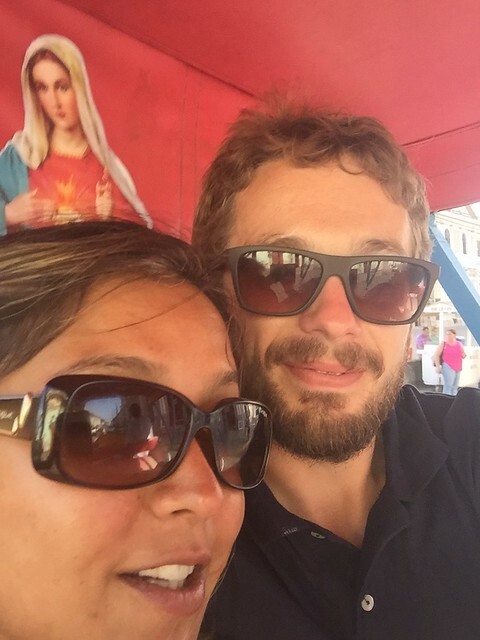 Craving some local food, we hit the main zocalo and found a local guys outdoor restaurant in the middle. 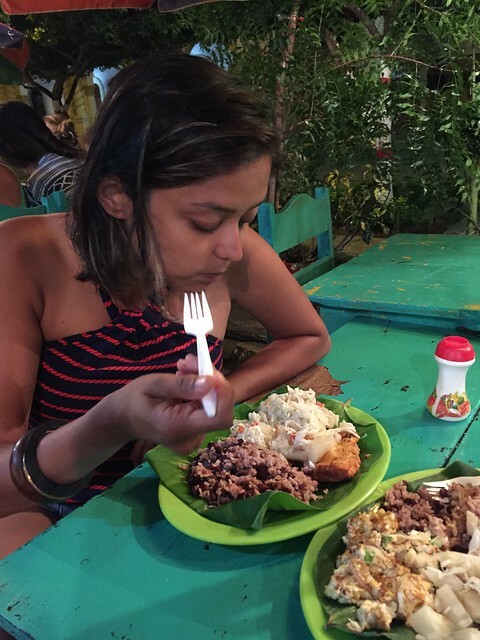 He served us up some gallopinto (nica style fried rice and beans), eggs, cheese, avocado and a few other veggies to tide us over. All served up on a banana leaf. The cheese was salty, as it is everywhere south of Mexico but quite tasty in moderation. 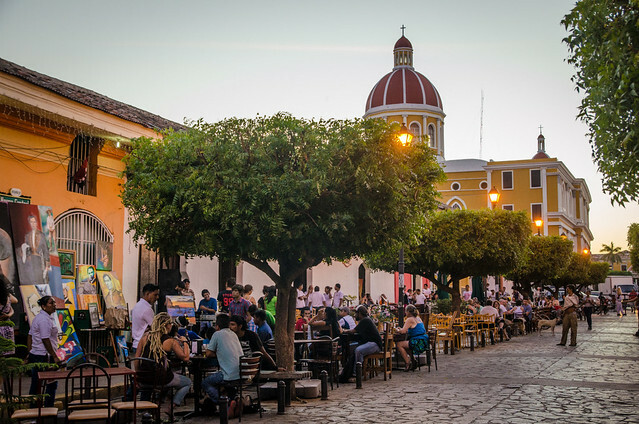 The Main Street in Granada is a pedestrianized tourist hub. There are mainly high end restaurants and bars on the street, all giving out some kind of happy hour cocktail deal. 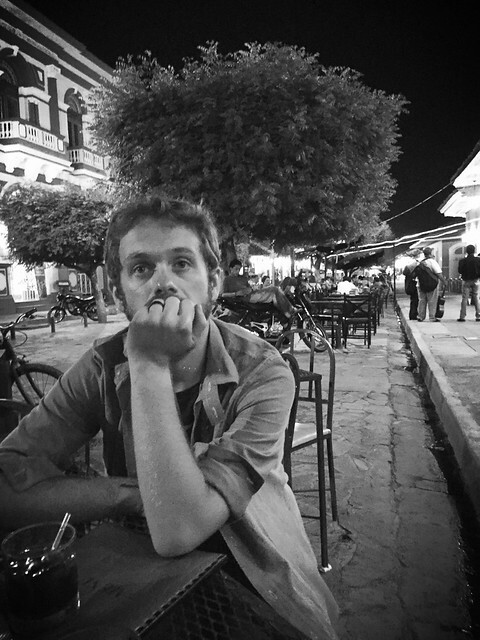 We drank a few Cuba libre and people watched for the night. I seemed to look like a guy who wanted hammocks as every ten minutes men, women and children approached me with their design laid out in front of me. I think I had a nightmare about hammock sellers that night. The malaria tablets had well and truly kicked in. I went for my routine run the next morning, trying to check out the local side of town as we seemed to be bombarded completely with tourists the previous day. Down by the lake’s waterfront things were a little more quiet. And the yet to be paved road was surrounded by tiny huts where kids kicked up the dirt playing soccer. I tried a fancy football backflip to them while running past and nearly fell over myself, much to their delight! 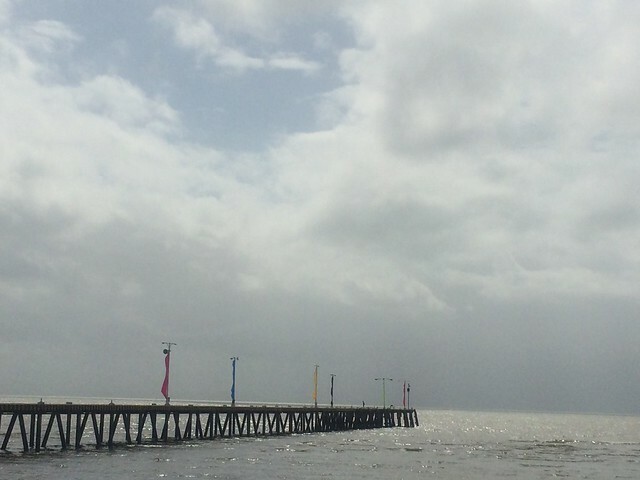 The lakefront of Lake Nicaragua gives the sense of a rough ocean front. In fact, when the Spanish arrived, they thought they’d already arrived at the sea, instead finding a beautiful island with two volcanoes and more land on the other side. We were given the grand tour of the city by horse & carriage in the afternoon by a fluent horseman’s not so fluent brother. They did a very quick switch-a-roo on us there but it was lovely all the same. 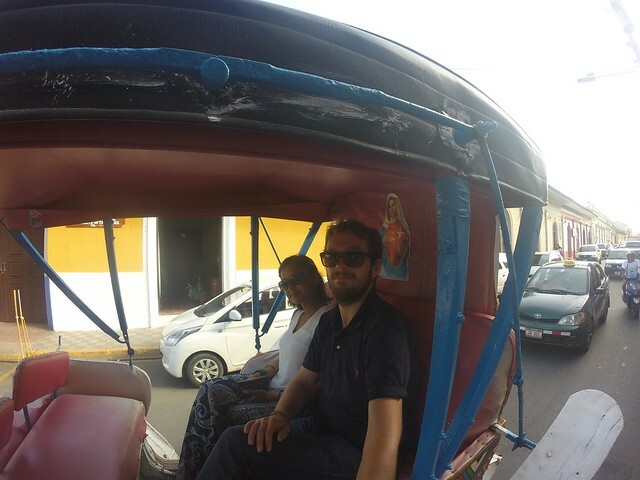 Mother Mary adorned the carriage which made us feel very safe! The highlight on this trip was the town’s main cathedral. 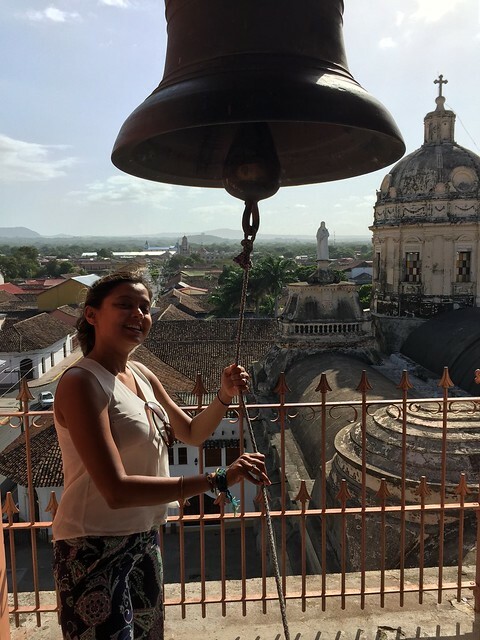 You can go up the bell tower for a couple of dollars. 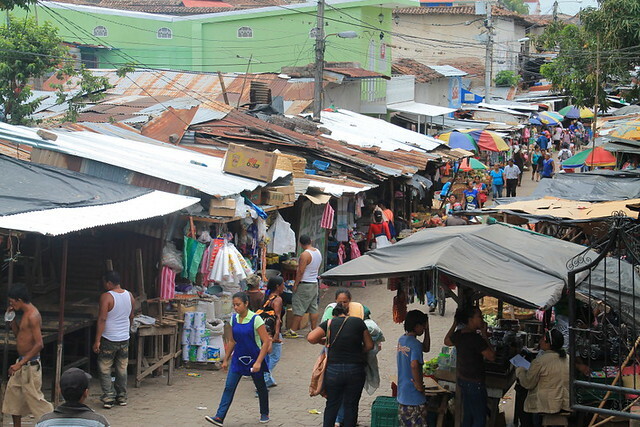 Granada is a low town with nothing over two stories, a law in this part of Nicaragua. This allowed us grand views over the square all the way down to the lake. One of the cities highlights is the market which sprawls out towards the zocalo. This is another place you can just get lost in and enjoy the sellers and buyers at work. It was also the home of our bus out of there the next day, which we tried to locate. We ended up failing and reverting back to the pool. after some locals gave us some vague details (down past the chickens, turn right at the fish). 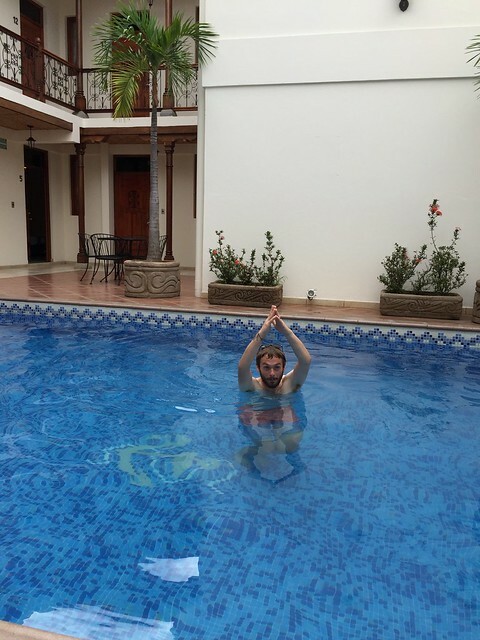 This time I needed to practice some synchronized swimming.. of course! Neem had a sunset yoga class and I had a sunset bar to attend to! I sipped a beer with a fellow Irish man who was on his summer holidays from teaching. All this while Neem was on the roof stretching in the dense afternoon humidity. I think I chose the right option and hey, I’d already done 4 miles earlier on. Up until now we had a competition to see how many of each others nationalities we would meet on the road. Neem had now conceded the battle. Unfortunately, the number of Indians traveling these parts are quite low, partly I guess because of visas but some of it is I’m sure the lack of backpacking culture in India. We’re currently writing a Visa page for our travels which may help people trying to get information on the former. 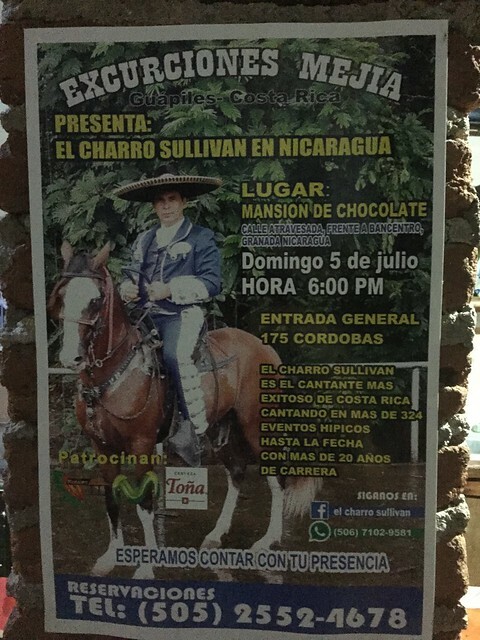 Unfortunately, “El Charro Sullivan” was in town just as we were leaving. He looks quite a lot like our own El Charro Kevin Eddie O’Sullivan. I guess he wanted to keep his new job quiet. Before we left the fancy hotel, we almost got into the height of trouble following an attempt at a bit of hair coloring for Neem. I adorned some plastic gloves to keep myself clean, but We may have went a bit purple crazy. With some industrial strength hair color staining the whole bathroom, including Neem, there was a little panic. We smartly folded the purplish towels and made sure we were miles away before the hotel got sight of them! 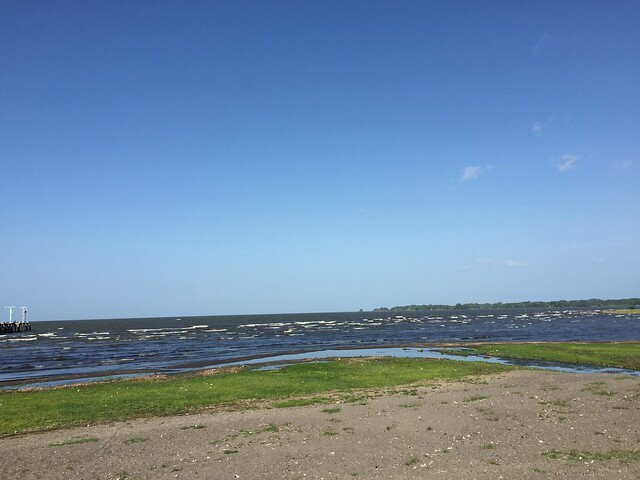 The dual volcano island in the middle of Lake Nicaragua known as Ometepe Island was our next goal, deciding to do it the local chicken bus and ferry way. We were also unable to find a hostel to book, so we knew we’d have a little challenge ahead of us. My New Job was supposed to be a secret!!! !